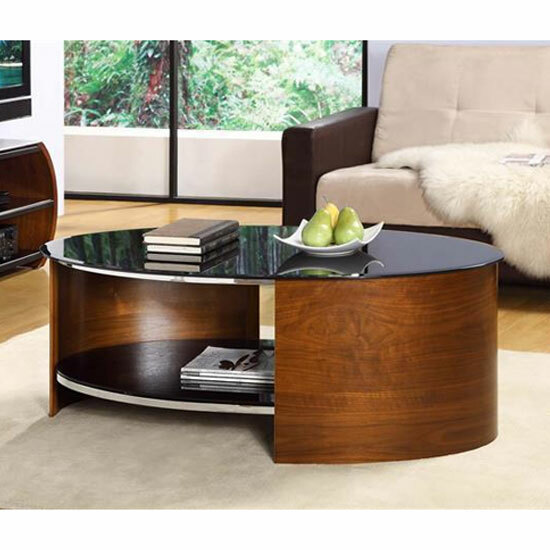 For a coffee table, oval is certainly one of the classic shapes. In other words, it means that you will not have to carefully weigh over every other detail in your living room – small oval tables are neutral and can be combined with the widest range of other interior arrangements. As a rule, wood can be combined with any other materials you have in mind. Of course, in an ideal world, your living room should feature other wooden furniture to make the picture complete. However, with a little imagination, it is possible to integrate an oval wood coffee table into any environment. Perhaps, the only room that will not benefit from such an arrangement is a very contemporary living room, featuring a lot of high gloss, LED lights, glass, and metal. Solid wood comes in many colours – from practically white ash to the darkest shades of mahogany. So, it will not be difficult to choose something to your liking. Even if you already have other wooden furniture in your living room, you can still find a shade that would match your overall interior theme. As it was already mentioned, oval wood coffee table is not one of the widespread models, so if you are looking for something that can characterize you as an out of the box thinker, wooden coffee table might be exactly what you are searching for. Like all other furniture items made of wood, such table features a very solid build and high durability. In fact, most wooden furniture pieces are replaced because they go out of style, or because homeowners grow tired of them – not because they got broken or damaged. To sum it up, an oval wood coffee table will be perfect for those homeowners who are striving to create a classic, yet at the same time modern, look and feel in their apartments. In general, wood makes any room look cozier and more welcoming. Plus, a wooden coffee table will look really good in a combination with most of the contemporary living room furniture – provided, of course, your living room interior has other wooden items installed.